We are offering our clients with Brass Tube Fitting that are manufactured using high grade raw material and latest technology. Conform to international quality norms, our fittings basically consist of three components such as nut, body and gasket ring or ferrule. 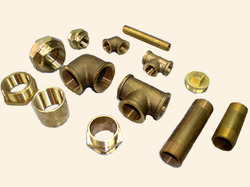 In addition to this, our fittings are available in various sizes, shapes and designs at industry leading prices to fulfill the demands of our clients.